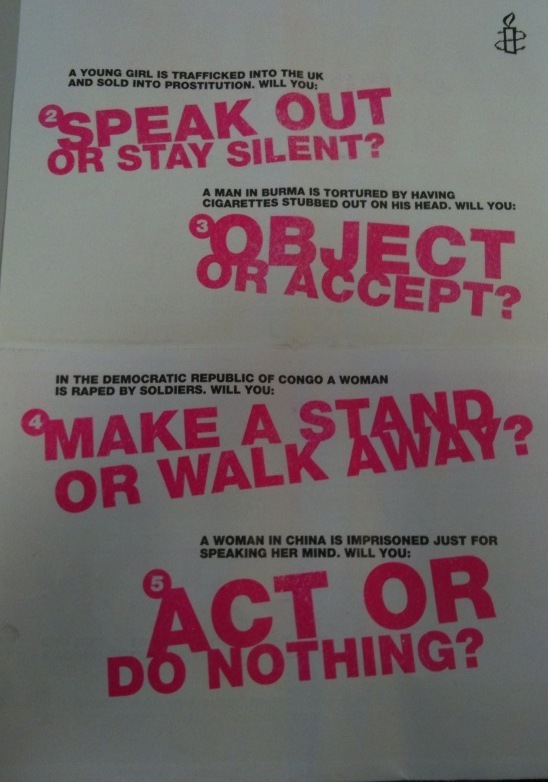 I came across this appeal last week from Amnesty International. It popped out of a paper I was reading on a train and I thought it was really engaging. I am a big fan of long Direct Mail pieces, three, four pages, go for it. But for a short piece I really liked this. 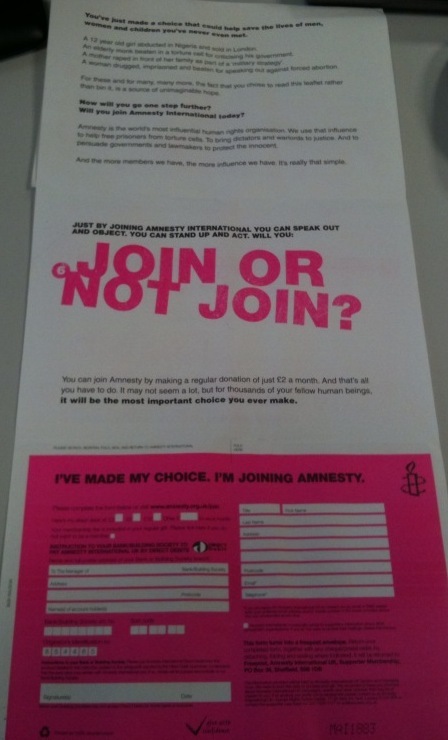 I would love to know more about it, does it form part of a larger campaign, is it across different channels etc…I mentioned it on twitter and Amnesty UK said they would let me know the results, so if they do I will share them. And the proof is this…….. Irish Autism Action has been a real leader in charity blogging in Ireland and the hard work paid off last weekend when they won Best Group Blog at the Irish Blog Awards….well done Lisa. Over the past three weeks I have been involved in events where there was a reluctance to ask people to give. Well that’s not entirely true. There was a general feeling that asking people to “give what you can” was the appropriate ask. I have always fallen firmly on the side of……you need to tell people what you want them to do, if you dont, they do nothing. This was borne out in what I have observed over the past few weeks. When you ask people to give what they can, they dont know what you want them to do. They start questioning whether the amount they had in their mind is too little, or not worth the call. Once they start to question what they should do, you lose them. When you tell people exactly what it is you want them to do, they then only need to think about whether they want to make the donation or not. I also believe that you don’t lose those who can’t afford to give at that level, because they may still feel passionate enough about your ask to donate something. I have been following Alex’s Lemonade Stand on Twitter for a good while now. I can’t even remember how I came across the organisation. But I think they are possibly my favourite charity at the moment. They have a clear vision and mission and its all based on a simple and great idea. The origins of the idea, from Alex herself, are a lesson to us fundraisers. For me it reminded me, again, that fundraising doesnt have to be complicated to be successful. Alex had an idea and a goal and she made it happen. She was 4 when she set out to reach her goal. Kids can teach us so much can’t they! I know I haven’t told you much in this post about Alex’s Lemonade Stand, but watch this video and you will find out all you need to know. Then go visit their website. The goal of many corporate partnerships is to provide volunteering opportunties for staff. Now for some this is easy to offer, for others being able to offer this just isnt an option. I have been in a situation where we lost charity partnerships because we couldn’t offer any hands on volunteering for staff, fundraising opportunities werent enough. The company wanted there staff to get stuck into the work of the organisation and get a real sense of the work we were doing, the impact of our work, so they could then engage staff in fundraising. But we just couldn’t offer that. I think we missed a trick and should have found other ways to demonstrate our Impact to them that could have achieved this goal, but we didn’t. While it might be good fun for a group of your employees to get together and paint a school or tidy up a park it probably isn’t the best use of their skills and time (unless of course you run a painting and decorating company or a landscape designers in which case they are the best people to do a really good job! ).Linking volunteer effort with your organisation’s core skills means that you offer far more value and better outcomes to the non-profits you wish to serve. It’s also more likely to lead to skill development for your people – one of the sound business reasons that companies get involved in volunteering. For a non-profit reading this I think it gives us the opportunity to re-think this challenge. And we need to design volunteering opportunities that deliver on the skills and expertise of the company we want to partner with. I think its ok to challenge the conventional wisdom that painting a wall is what is required. If you haven’t come across Drayton Bird yet, read the rest of this post and then follow the link at the bottom, go to his website, sign up to his useful tips and buy his books. He provides such great insights and while his focus is Direct Marketing I apply his ideas to a lot more of my work . I had a meeting with the managing director of Mercedes Passenger Cars about 7 years ago when we started doing their direct marketing. He was concerned about the tone of their copy – and in fact that is why we got the business. 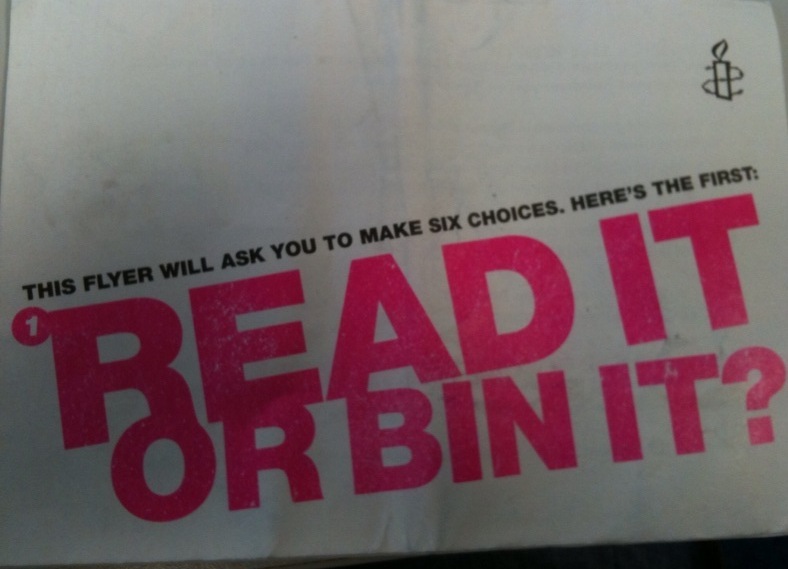 So, Helpful Idea No 25: Read your copy out loud. Does it sound like someone talking? It should. And does it sound like typical “sales” copy any one of your competitors could run. It shouldn’t. The other thing to watch out for is that the language must be appropriate to the writer – and the recipient. If you’re supposed to be the chairman, write like a wise and friendly adviser. If you’re writing to another chairman, write as an equal. If you’re supposed to be someone who handles complaints, adapt accordingly. And so on. It’s deceptively simple – but not that easy to do. You just have to work at it. PS Don’t forget – if you have a friend or colleague who you think would like to hear from me, please forward me their address. They’ll get a polite invitation – which they can decline – and I never share my email lists. They posted on Twitter last week that they wanted to get opinions on their new ad. I like the ad, it will be shown in cinemas only. I did wonder whether or not the call to action should have been stronger on text than the website. I am not sure what their goal is, if its donations, and I think it is, could people not be encouraged to make a 5 pound text donation during the ad (lets face it we all still have our phones on at that stage) and the ad can still end with the web address.